The band said a hypnotherapist was brought in to see how it would affect results as they recorded latest album Mylo Xoloto, which was released this week. Former Roxy Music star Eno - who has worked with the band repeatedly - is known for his wacky methods to get the best out of bands. Bass player Guy Berryman said: "We're not afraid to try different things. Brian Eno brought a friend in and the four of us were playing music under hypnosis. It didn't really come to anything. You try 10 ideas and only one works. But nothing is too stupid for us." Eno, who has been behind albums such as U2's Achtung Baby, is known for his "oblique strategies" - a pack of cards with strange random instructions for musicians to encourage them in different directions. He spoke as the band launched their fifth studio album in Madrid ahead of a major show at the city's Plaza De Toros De Las Ventas. 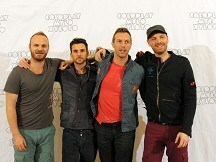 Frontman Chris Martin had an uncharacteristic expletive-packed rant during a press conference as he made clear he had been angered by a number of "plagiarism" claims against the quartet. He and the band also ruled out ever making an appearance on ITV1's The X Factor as guests or mentors, but he said they were all fans of the show. And he said in the past they had actually voted for former contestant Stacey Solomon. "We all watch The X Factor, but I don't think we could go on it. I think it's just that we do something very different to that," he said.